For their home renovation, the owners bore in mind a healthy and energy efficient residence with lots of light and open spaces. Having conferred on this with their architect, they decided to renovate according to the passive standards, which implied a rather complex renovation of the existing building. The main volume was stripped down entirely and equipped with a new insulation shell. The storey was raised and subsequently provided with a roof structure. The existing annexes were completely demolished and replaced by a well-isolated and highly compact annex building. During the renovation the owners decided to position the bedroom on the first floor and maintain the original arrangement to the largest possible extent. By raising the storey, more room became available for the living areas. The owners preference for renovation instead of the total demolition and reconstruction of the existing building is founded on three reasons: the favourable structure of the existing building, the economy of resources by preserving the existing structure and the reduced VAT rate of 6%. 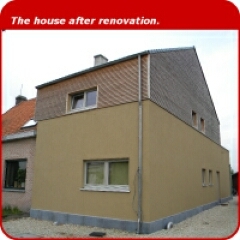 After the demolition works the remaining structure was insulated by means of façade insulation composed of I-joists and filled with cellulose insulation. The common wall was insulated by placing a 30 cm front wall injected with cellulose, which will maintain an adequate insulation level in case the adjacent building is deconstructed or vacant. The inclining and flat roof were constructed in the same way. The new annex was erected using a wooden frame construction provided with cellulose. The floor was insulated by 26 cm of insulating sole plates. The outer joinery is provided with triple glazing, the cavities between the glass sheets are filled with argon and the wooden frame is thermally interrupted by two cork layers. The walls of the existing construction were equipped with an airtight barrier and a block of cellular concrete. The thermal bridge situated at the connection of the façade with the common wall was reduced by the insertion of an isolated front wall on the inside. To restrict the thermal bridge due to the installation of the roof windows, an additional inner window was placed on the inside. The house was equipped with a ventilation system D with heat recovery, connected to a ground-glycol heat exchanger. In the winter the incoming air will be heated by the exchanger before entering the balance ventilation system. In the summertime the air is cooled in advance before being blown into the building through a bypass in the ventilation system. Activating this bypass will prevent the incoming air from being heated by the outgoing air. The building receives additional heating from an electrical resistor in the supply duct of the living area. The bedrooms and the bathroom are post-heated by an electrical heating element which can be activated when necessary. The preparation of sanitary hot water is realized partly by a heat pump boiler (which receives its energy from the remaining heat of the outgoing air having passed through the heat exchanger of the balance ventilation system) and partly by flat plate solar collectors mounted on the inclining roof. During periods in which these systems are unable to produce sufficient sanitary hot water, an electrical resistor within the boiler will step in.